RCWL-0516 is a mini doppler radar microwave motion sensor module which can act as an alternative to a PIR motion sensor. 360 degree no blind angle detection and maximum 7m sensing distance with adjustable delay time and sensitivity. It is perfect for DIY microwave motion sensor light switch, human sensor toys, smart security devices, etc.When triggered its trigger output pin will switch from (LOW) 0V to high (3.3V) for ~ 2 to 3 seconds before returning to its idle LOW state. 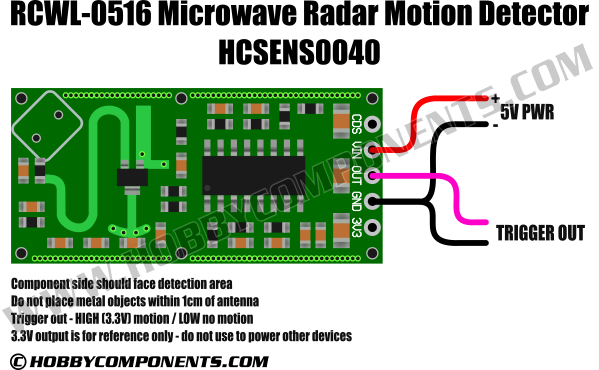 While the RCWL-0516 can be used on its own it also works well as a sensor for a microcontroller or a microcomputer. You can use the RCWL-0516 to detect movement and then have your controller take additional action. We’ve seen a number of articles and videos about hooking up the RCWL-0516 to an Arduino so that you can turn on an LED when it detects motion. And while this does serve to illustrate how the hookup is performed it really has no practical purpose – after all, you can just drive the LED directly with the RCWL-0516 and eliminate the need for the Arduino! Instead, I wanted to use the Arduino for something practical. And the first thing I came up with was a latching device. You can see how to wire it up here. In this circuit, we have used an Arduino Uno, an RCWL-0516, an LED, a couple of resistors and a push button switch. The resistor attached to the LED is a dropping resistor, we used a 220-ohm resistor for this. The color of the LED is entirely up to you. You could also use a relay instead of an LED if you wanted to control something that needed more current or voltage, if you do make sure you observe all safety precautions. Best bet is to use an LED during development, it’s much safer that way. The other resistor is a pull-up resistor for the switch, I used a 10K resistor. The purpose of this device is to keep the LED on after the proximity detector is triggered. In the basic hookup, the one without an Arduino, the LED only remained on for about two seconds. This time I want it to be left on. The push button is provided to turn off the LED, in a sense it “rearms” the circuit.